I just thought I'd share a few pics of another creative project I've been working on. It was Isabelle's 3rd birthday last friday, Niall had been building this little summer house for her the past few weeks and I decorated the inside. 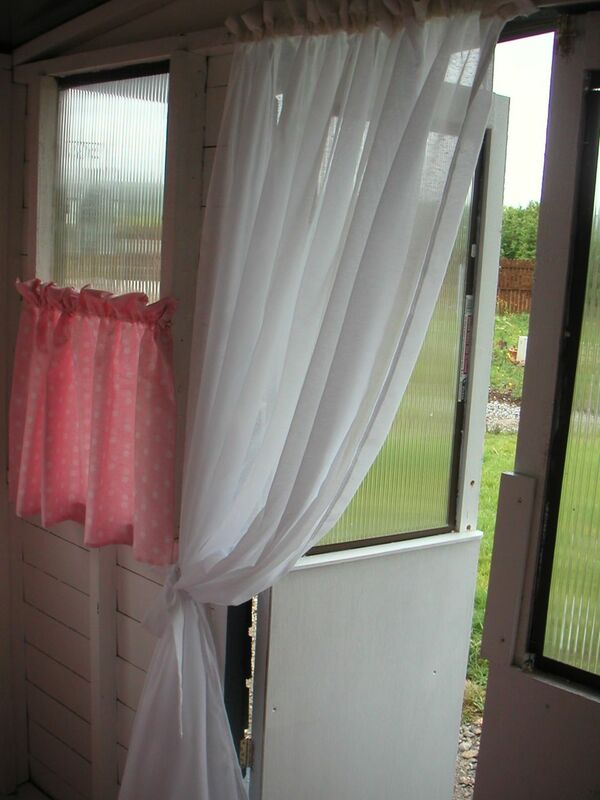 My mom is much better at sewing than me so she made all the lovely curtains, blinds and cushions. 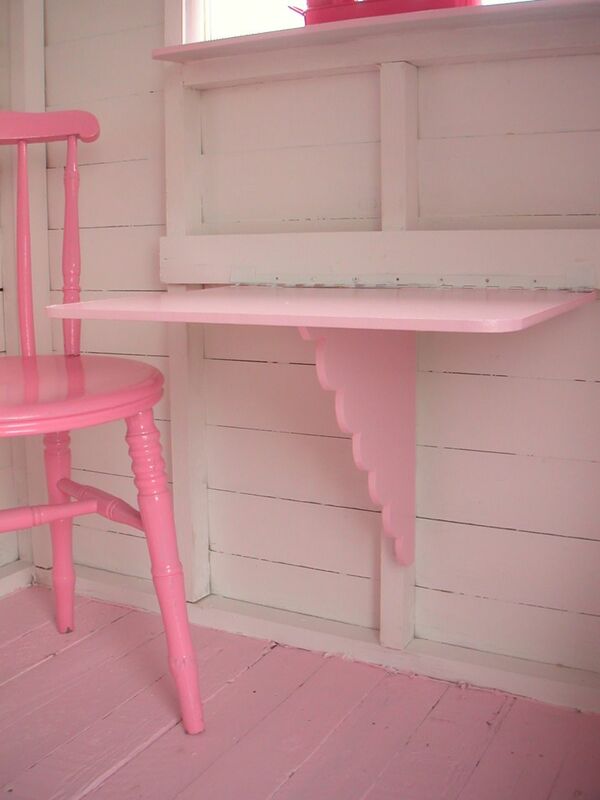 Niall made this cute little fold down table out of some spare MDF, it really saves on space. 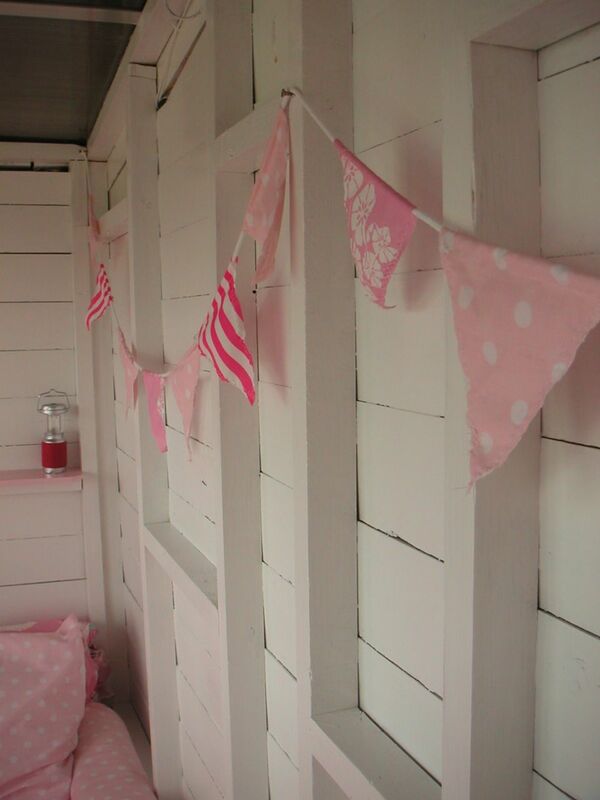 I had loads of pink paint left over from decorating Isabelle's bedroom last year so that's why there's so much pink! The old chair used to be my grandmother's. 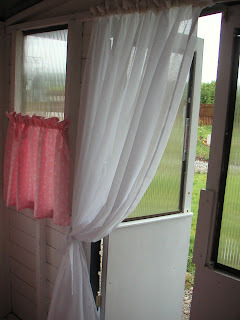 I love this style of blind, it's so easy to make and is really pretty. 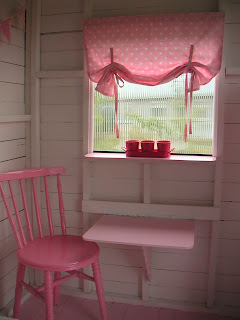 All the fabric came from a polka dot duvet cover. Niall did a little scallop edging with the jigsaw, we drew out the shape using the lid off a jar! The little table is attached to the wall with a piano hinge. 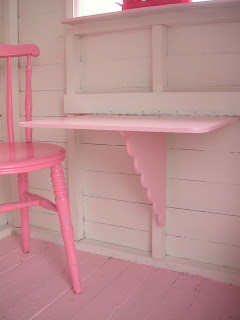 I mixed a little white paint with the pink paint to make the pale pink for the floor and table. Niall made a simple day bed from MDF and a simple wood frame. The pillows came with the duvet and my mom made the little bolsters. Niall repeated the same scallop detail on the bottom of the bed and I used the same pink paint to finish it off. 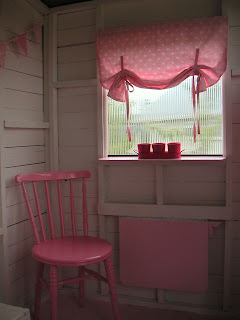 I did manage to make a little bunting with the left over bits of fabric, they really make the place so cheery! 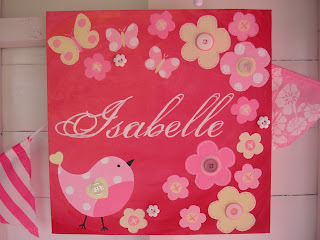 Oh and I did a little painting with her name and a few little pretty flowers and a matching birdie! Isabelle was thrilled! It's so nice to have a little place in the garden to go to, especially with our unpredictable weather, we'll be having lots of tea parties!!! 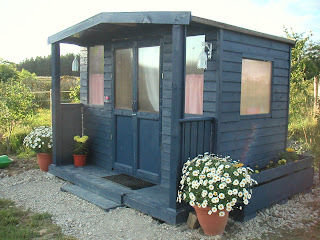 The little house is absolutely beautiful! And the decorations are fabulous! omg it's beautiful ! She looks so happy ! 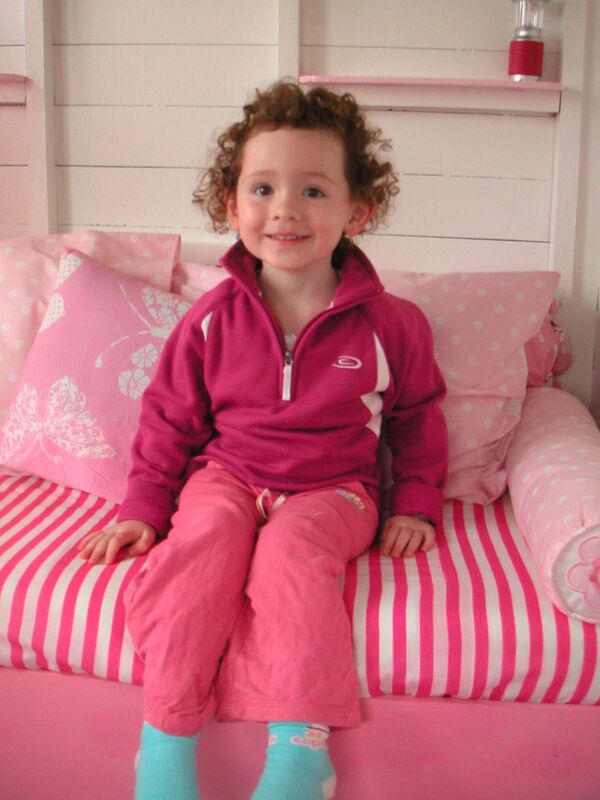 Oh how sweet and adorable! 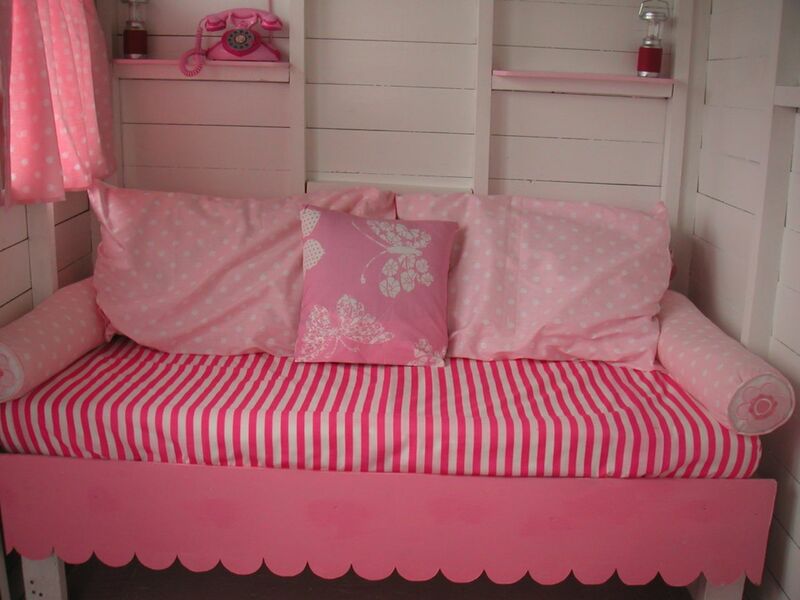 I'm sure the adults had just as much fun making this as your daughter will have playing in it. Your little one will have hours of fun in there. 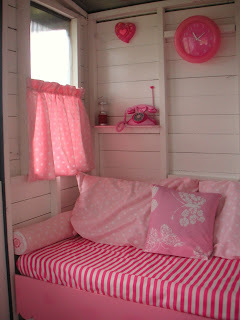 What am amazing little house for your daughter! 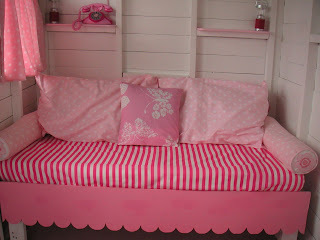 I LOVE how you did this up so pretty and pink! And HOW gorgeous is Isabelle!!! A little girls dream house...how wonderful! Oh my this is so lovely. What a lucky little girl indeed!